Ready to pay for your private lessons? On the day of your private lesson, please arrive at Sunridge at least 20 minutes before the start of your lesson. If you are renting equipment, please complete a rental form at Sunridge for each person renting equipment. When you click the OK button, you will be redirected to PayPal where you can pay for the private lesson. Your private lesson is only confirmed when your payment is confirmed. Note that you don't need a PayPal account to pay with PayPal. If you wish to verify that all the information is completed correctly, click the Cancel button and then review your private lesson registration. Pre-paid private lessons are not refundable unless the hill is closed due to cold weather. A re-scheduling fee of $35 is charged if you can't make your pre-paid private lesson and wish to rebook. If our group lessons don't quite fit your schedule or you prefer one-on-one instruction, then consider taking a private lesson. 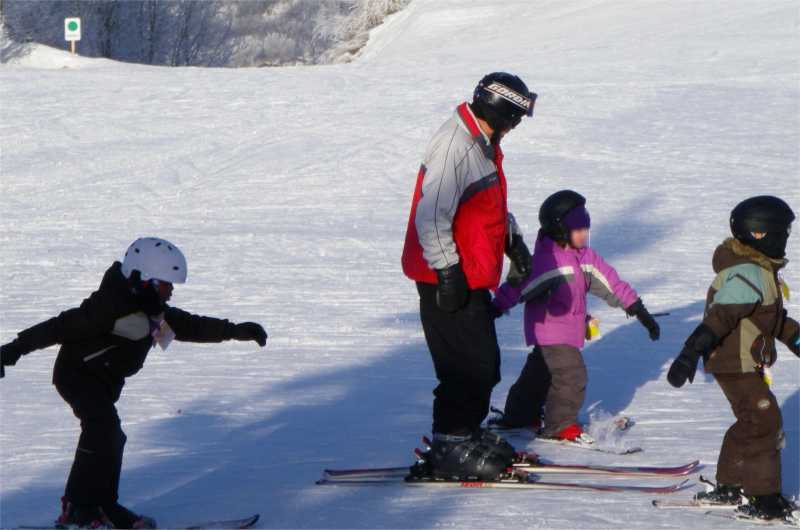 Our private lessons are available for all ages and abilities and a lift ticket for the whole day is included in the price of a private lesson. The cost of a one-hour private lesson is $90 per hour for the first person and $50 per hour for each additional person in the same class up to a maximum of four people in the same class. Pre-payment is required to confirm your private lesson. You can register either by phone at 780-449-6555 or here online. If you are a season pass holder, please call us to register for a private lesson so you will receive your 40% passholder discount. First, enter your cell phone number (so we can text the private lesson transaction number to you) and the name of the first person in the class. If you have a preferred instructor, you may request them to teach your class and we will do our best to accommodate your request. Second, choose whether you want to learn how to ski or how to snowboard. Then, select the the time period for your lesson. Once you have selected a month, you have 5 minutes to complete and pay for your private lesson. Only the most popular time periods for private lessons are shown. If you wish to take private lesson at another time, just give us a call at 780-449-6555 and we'll try to accommodate you. Once you have selected a time period, enter how many people will be taking the class. The maximum number of people in a private lesson is 4 people and everyone should be around the same age and ability. If you need rentals, select how many people will be renting equipment (boots, skis/SB, helmet). For each person renting, you must complete a rental form at Sunridge when you arrive for your lessons. When all this information is entered, click the Pay button to pay for your private lesson (using PayPal). You will also receive an email with the private lesson transaction number and a PDF copy of your receipt. On the day of your private lesson, please arrive at Sunridge at least 20 minutes before your scheduled one hour lesson. If you are renting equipment, please complete a rental form for each person renting (be sure to know your shoe size and weight). Then stop by reception and show us either a printout of the email or the text on your smartphone and we'll print your lesson lift tickets. Then you are off to the rental shop for your equipment (if you are renting) and then onto the hill for your lesson. The lift ticket and rentals are good for the whole day. Please enter your cell number (to receive a confirmation text of your private lesson registration) and the name of a person taking the lesson. If you have a preferred instructor, you may also enter their name in the space provided. All pre-paid private lessons are non-refundable except when Sunridge is closed due to very cold weather. If you can't make your booked class and wish to rebook to another time, a rescheduling fee of $35 is charged.